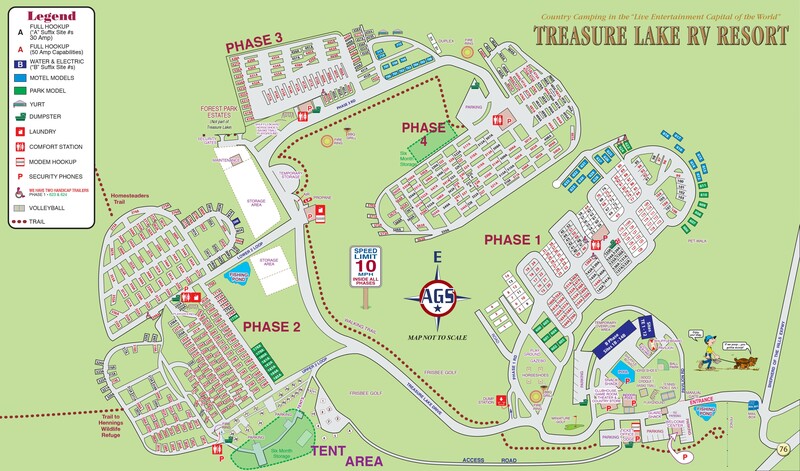 Ask fellow campers about "Treasure Lake RV Resort" and nearby attractions. This is the Premier place to stay when in Branson. Everything is there.. We camped at Treasure Lake RV Resort in a Motorhome. What can a person say; it's Branson! There are so many things to see and do, it's everyone's paradise. We stayed in Phase 4 for 10 days. We generally like phase 4 bc its quiet but as a member I am disappointed that the upgrades we've paid for over the last few years (leveling sites, concrete etc) have all been taken up by the permanent residents. People are walking their dogs using electronic leashes, which is fine as long as we're not walking ours at the same time, but they are against the rules. The weeds were a foot high and not a single maintenance person in sight. We also have a large RV and found it difficult to find a decent sight with a 50 amp and had to use our 30 and 20 to reach capacity. There were several that were available, but they were small and all grass, not even gravel. As a matter of fact when we arrived there were some campers that were moving bc of the mud. There are also residents back here that walk their animals but don't pick up after them. Some of the residents that are using the golf carts are using them more like a go cart and driving at full speeds. We had to make sure we got out of their way on several occasions. All in all I'm disappointed in the status of maintenance here. We camped at Treasure Lake RV Resort in a Motorhome. Excellent facilities at a very spacious, well laid out park actually in Branson. Minutes from all attractions as well as Silver Dollar City. Price reflects nightly surcharge of $8 and C2C discount. This is a members park so you have to belong or have an affiliate membership to stay here. We were here w/ family for Spring break so pretty much had the place to ourselves, but I imagine it really bustles in the Summer. Concrete, level pads w/ all hookups well placed. All in all, a well thought out true RV resort. Would definitely return. We camped at Treasure Lake RV Resort in a Motorhome. All of Branson is right outside the gates. This is a private membership park. I stayed here as a Coast To Coast member, not as an individual park owner. The park imposes an $8 nightly utility surcharge on top of C2C points used to pay for a site. The park is beautiful so I initially had no problem with this fee. Upon check-in, I was told that I must choose a site in sections 2 or 4. These are the oldest sections of the park, but I had no problem with this policy since I was not an owner. The problem is, it was extremely difficult to find a decent site in either section that could accommodate a 40' RV. Many of the sites are shallow and narrow. We eventually found a site but had to settle for 30A service. I am flexible, but I don't think folks should have to pay a utility surcharge for 30A service. A previous reviewer said most sites have concrete pads - this is incorrect. On our entire row, only two sites had concrete pads and both were taken by permanent residents. The sewer system in our section (section 4) was not properly vented. This created a back-pressure in sewer hoses that resulted in a frequent outdoor sewer odor. The park itself is beautiful and has a lot to offer. They have a great little 50's diner, an indoor and outdoor swimming pool and a wonderful concierge staff that helped us get great show tickets. It just a shame that the park doesn't invest in it's infrastructure. It could use better site maintenance, 50A upgrades and better sewer venting. We will come back to Branson, but we will stay elsewhere. We camped at Treasure Lake RV Resort in a Motorhome. Very nice park in 4 phases, covering 350 acres of tree covered hillsides with paved roads; lots of paved pads; some still gravel but in the process of adding more concrete all the time; most sites 50 amp but still some 30 amp but upgrading work going on all the time. End result will be 50 amp and concrete at all sites. We camped at Treasure Lake RV Resort in a Motorhome. Branson, MO! There are numerous things to do; too many to mention. Silver Dollar City is also nearby. Table Rock Lake is right down the road. You will never run out of things to do in this park or this part of Missouri. Stayed in site 302, nice back-in site with ample space all around. Cement pad with full hook-ups. Check in was a breeze, all paperwork was ready to go, you pick your own site and were told which area Coast to Coast and RPI could use since it was during their busy season. All paved roads and most sites have cement pads, they are putting in more pads everyday. A lot of work improving park. Convenient to all of Branson attractions. Like staying here. We camped at Treasure Lake RV Resort in a Motorhome. Had a back in site on gravel in the trees. Luckily found a gap for my sat dish to work. My full wall slide had to dodge the pedestal and over hanging branches. Here for a rally and it was ok with narrow paved roads and my area had terraced back in sites on gravel. To get coach in and have enough room for car in front I had the rear wheels at full rear. The coach rear hung out and I had to get on a ladder to check my engine fluids. It just isn't my style or idea of what great sites are. Probably would look elsewhere if in area. We camped at Treasure Lake RV Resort in a Motorhome. Stayed one week in Site 118, nice level site with full hookups. Have been to this campground several times, always clean and friendly staff. Love being in the woods but right in town too. Very convenient to all Branson has to offer. We camped at Treasure Lake RV Resort in a Motorhome. Very nice and very large RV resort with paved roads and sites with concrete pads or gravel. Like everything else in Branson built on hills with terraced sites. Be aware of resort fees and tax of over $10 per nite added to price listed. Premium pull thru sites but mostly back-ins. Many towering trees for good shade and open sites for satellite. Strong open wi-fi at sites and good cell signal. Nice pool, large club house with activities and weekend breakfasts. Resort spread out, clean and well maintained. Security gate. Staff helpful and friendly. Deer and wild turkeys wandering thru the resort. Caution; 100# water pressure in Phase 4 section. Will stay there again. We camped at Treasure Lake RV Resort in a Fifth Wheel. Get show tickets at the Branson 2 for 1 Tickets outlet in the purple bldg. for the best selection and true 50% off show tickets. They have discounts on almost 100 of the 125 weekly shows and no gimmicks. They charged us $10 a night for an improved maintenance fee. Very clean and quiet. You choose your own site and we have a pull-through with 50 amp service. They sell show tickets at the Lodge and have meals available too. There is an indoor swimming pool, walking paths, mini golf and tennis courts. We camped at Treasure Lake RV Resort in a Fifth Wheel. Recommend seeing the show SIX and going to Top of the Rock. Very nice, very large resort with activities and all the amenities. Flat site, but close together. Price reflects a $7 per day charge for electric which is more than most RPI resorts charge. Good Verizon and Direct TV coverage. Nice location in town. Quiet. We will stay there again and hopefully for a longer period of time. We camped at Treasure Lake RV Resort in a Motorhome. Branson activities. Check with the resort for show discounts as they have a person dedicated to show/attraction discounts. We stayed here for 2 weeks in a 42 foot motor home with a toad, our spot was very serene and level. Great walking path for us to take the dog for long walks - entertainment at the clubhouse was great. Everyone at registration was delightful. A little difficult to find a shave pot, you need to drive through first and check it out, but I guess the great part about that is that you can actually have the spot of your choice. Many attractions and restaurants within walking distance. We had a wonderful stay and would highly recommend to friends. We camped at Treasure Lake RV Resort in a Motorhome. We arrived and checked in at the Welcome Center where we were handed a huge map of this 500+ space park and told we should go "find" a place in this hilly, sprawling development. They gave us a little green card to clip onto the chosen numbered site marker and a security guard would pick it up sometime later. We're a 44', 50 amp motor home and the map gave absolutely NO information of the sizes of the spaces. We had to stop in an overflow area and disconnect our tow car so we could drive over the acres and acres of the park trying to find a spot. The only indication of a 50 amp connection in the vacant spaces was "if" the face of the electric panel was painted red. The only vacant spaces we found with these red panels were either too small for us or horribly out-of-level. There were many 50 amp sites that were occupied by 5th wheels. In frustration we returned to the office to tell them we couldn't find a space. They told us we could stay in the "overflow" area just outside the outdoor pool - spaces with no sewer connection and way too small for our 44' rig. Also too much slope for us to level our coach. We are now parked in this completely inadequate space and will leave first thing in the morning. We will NEVER come here again! The amenities at this huge park were very appealing, all facilities are very clean and well maintained, but we will never come here again. We spent way too much money on a Coast to Coast membership to be treated so shabbily. We camped at Treasure Lake RV Resort in a Motorhome. 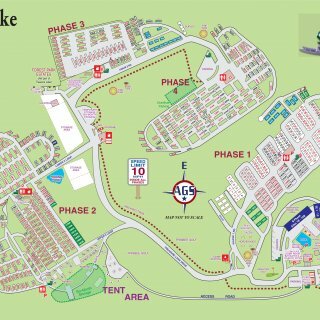 Huge RV park with 4 separate camping areas. Each camping area has it's own comfort station with very clean bath area and laundry room. Each area also has it's own playground. At check-in, we were told we could pick any site in the park. 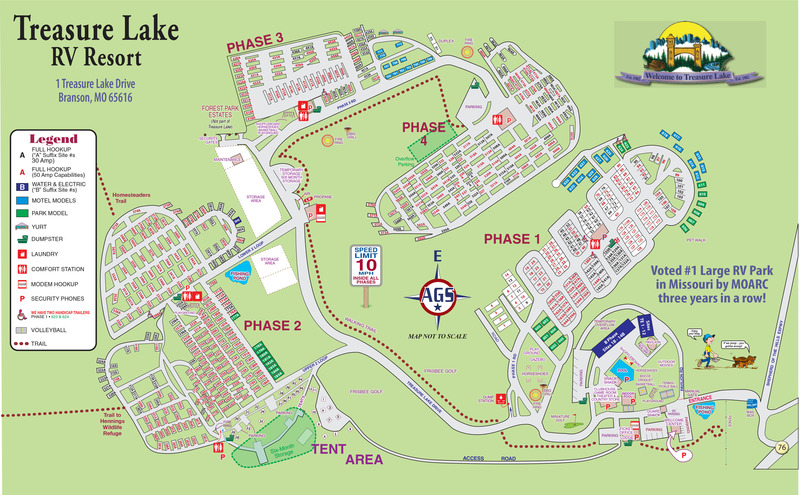 You need to use the park map as you search for your site because the 4 camping areas separated by lots of trees & hills. They assign sites during the busy season. Not sure about all areas, but our back-in site in area 3 was a level concrete pad on a paved road. Plenty of space between sites, and good utilities. We were able to get a good Wi-Fi signal from our site (420) in area 3. No cable TV, but received plenty of channels from roof top antenna. This park has a lot of amenities available such as indoor and outdoor pools, tennis courts, basketball court, shuffle board, horse shoes, mini golf, and Frisbee golf. There is also a paved walking trail along the main road to the clubhouse. The park location allows easy access to Branson activities, but is also very quiet & peaceful. We will definitely return. Rate is Coast-to-Coast + $7.00 daily resort fee. We camped at Treasure Lake RV Resort in a Fifth Wheel. Large wooded quiet RPI park right behind IMAX so VERY close to Branson activities. Many sites are terraced and close, but we found a great private site (406) in section 4 with satellite access. Best showers in a long time (large & clean). Nice clubhouse, mini-golf and indoor pool still open. Would DEFINITELY recommend and stay here again. Saw deer & wild turkeys in park. Park charges $7 service charge above RPI rate. Worth it. We camped at Treasure Lake RV Resort in a Motorhome. 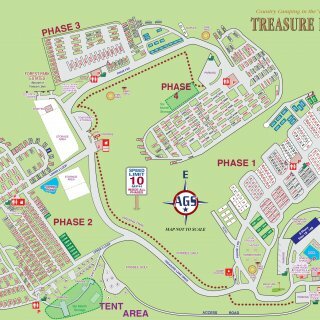 Are you affiliated with Treasure Lake RV Resort ?